There are multiple ways to pop New Year's champagne: the Super Bowl air-spray, the casual Diddy pour-on-the-floor, or, if you're feeling awesomely Napoleonic, you can slice the damn thing open with a sword (or good kitchen knife). Here's how. 1. Choose your weapon and gather your gear. If you've purchased a pricey ornamental champagne saber, whip it out. Otherwise, a solid butcher's knife will do just fine. And have some glasses (and maybe a couple of towels) handy. 2. Be sure to start with a bottle of champagne that is very cold (38-40°F, tops). Remove the foil wrapper and little wire cage. This will make for a clean break, although some people say it's not necessary to remove the packaging. 3. Grasp the bottle properly. That would be firmly, by the base, and pointed away from any onlookers. Hold it at a 30-degree to 45-degree angle. 4. Locate one of the two vertical seams running up the side of the bottle to the lip. That intersection is where the bottle will break the most cleanly, and that's where you want to aim your stroke. 5. Do the deed. Hold the knife flat against the bottle, blunt edge toward the top with the sharp edge facing you. Run your saber or knife slowly back along the seam toward your body. Then, quickly and firmly thrust it back up the seam toward the bottle's tip. Strike the lip sharply, making sure the leading edge stays down and in toward the crook of the lip. Apply a solid follow-through. 6. Enjoy. If you've performed the task properly, the cork (with a little ring of glass around it) will fly off the end of the bottle. You'll then commence pouring the bubbly, and offer a witty toast. Opening a French bottle takes a couple of tries. 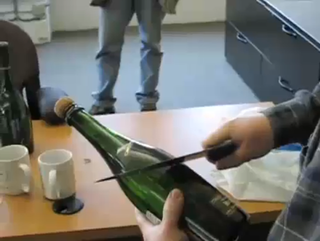 Doing the saber trick with a bottle of American "champagne," we find the results far less desirable: French and Spanish bottles tend to break more cleanly.